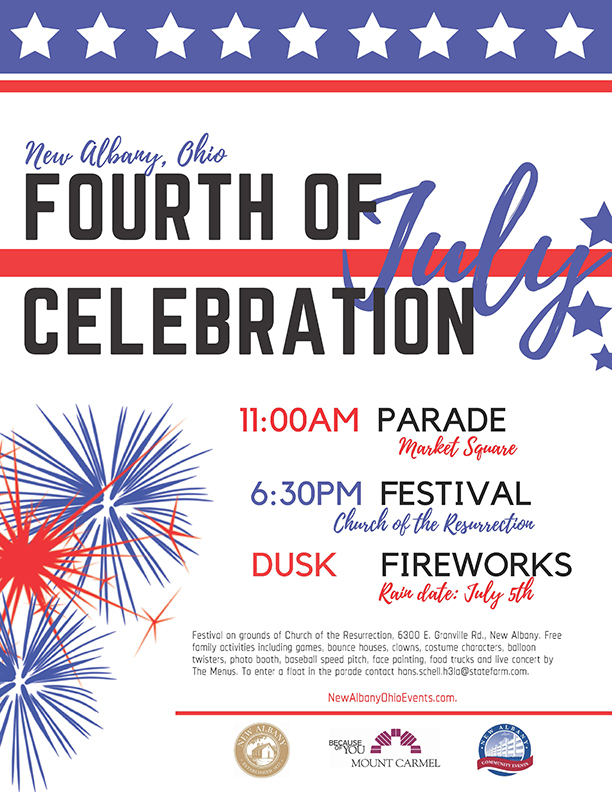 Mark your calendar for New Albany’s Fourth of July celebration. The New Albany Symphony 5K Run and Walk, sponsored by Orangetheory Fitness, will feature a 20-yard Ready Set Grow Toddler Crawl, Maple Orthodontics 1/4 mile Kids Fun Run, and the main 5K run and walk. Events begin at 7:55 a.m., with the 5K kicking off at 8:15 a.m.. At the conclusion of the 5K and before the parade starts, there will be a pet parade sponsored by Animals R Special. Click here to register. The parade kicks off at 11 a.m. and will wind from the school campus on Dublin-Granville Road to Market to Main and back to the school campus. A festival will begin at 6:30 p.m., prior to the fireworks, on the grounds of the Church of the Resurrection, 6300 E. Dublin-Granville Road, across the street from the high school football stadium. Free family activities including games, bounce houses, clowns, costume characters, balloon twisters, photo booth, baseball speed pitch, face painting, food trucks and live concert by The Menus. Parking will be available in the Heit Center and McCoy lots, as well as the high school, but high school parking around the stadium will be limited due to construction. Fireworks are expected to begin around 10 pm. The fireworks rain date will be July 5. Traffic from the high school parking lot and the Swickard Woods /Fodor Drive lot, traffic will be sent west only. When you get to the roundabout, you will not be able to come back east on Fodor. You must travel through the Heathgate/Meadway area or toward 161. Church of Resurrection traffic exiting on Morgan Road will be forced west. If you exit onto Fodor Road (right turn only) you will be able to choose once you get to Dublin-Granville and Fodor. Traffic that goes east towards the intersection of Dublin-Granville and US 62 will have two options only, straight through to RNA or south on US62. Traffic north on US62 from Market area will be forced east on Dublin-Granville towards Kitzmiller to Smiths Mill to US62 (Detour posted). US62 between Dublin-Granville and SR605 will be closed off for the hour. Traffic at Dublin-Granville/RNA from the west will be forced to either go east (with detour signs to get back to SR605 and US62) or south on RNA. US62 / SR605 – Traffic south from SR605 heading towards US 62 will be forced east. The only traffic coming south on SR605 from schools is in the area of 55 N. High, Annex and primary school loop. No traffic will be coming north on SR 605 from Dublin-Granville or from US62 and Dublin-Granville. Traffic heading west on US62 will be sent south on RNA to Fenway back to US62. Traffic parked in the northern lot of Primary School will be sent east on Chatham Green or north on SR605.